A little bit of industrial chic in the garden never hurt anybody. Who says you can't appreciate the natural world just as much as you love a good old-fashioned gear? 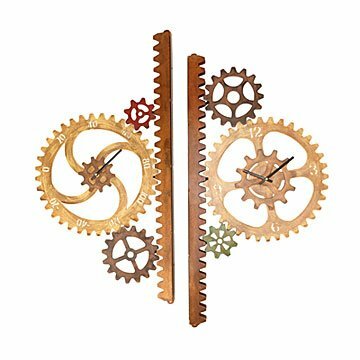 Certainly not Chris Crooks, whose Garden Gears Outdoor Clock & Thermometer—both made of rustic, expertly hand-finished steel—marry form and function, bringing a bit of industrial chic back into the vegetable patch. With hardware that lets you hang two ways, mounting either design on a wall or a post is a breeze. Just protect from rain and you're good to go, assuming you can tell analog time. Handmade in Arizona. Due to the clock and thermometer components, it is suggested that this item be displayed under an eve, overhang, or on a patio, but kept out of direct weather exposure. Clock and thermometer are sold separately. This is a made-to-order item. If you order today your item will ship no later than 05/07/2019. I hung mine in the living room. I love my front porch.I read there and the thermometer and clock keep me from totally forgetting about other things I have to do.